You can move appointments (and contacts) from a pst file into the Calendar (or Contacts) folder just by dragging them. If you added the account to Outlook desktop, it will be listed as Microsoft Exchange account type in Account Settings. Note that this is supported in Outlook 2010 or newer. I would like to export my Outlook calendar to the calendar at Live.com. How do I do this? It’s actually very easy to do. If you have your Outlook.com account set up in Outlook as an Exchange server account (you need to use autoaccount setup) then you can copy or drag the appointments from one calendar to the other. To drag the appointments to the Outlook.com Calendar folder in Outlook: Use a List view on your calendar, Select All (Ctrl+A) and using the Move to Folder command (or Copy to Folder) or drag them to the Outlook.com calendar in the folder list. If you are using an older version of Outlook and are unable to connect it to Outlook.com as an Exchange account, you can save the calendar as an .ics file and import it into Outlook.com. The maximum file size you can import is 10 MB. 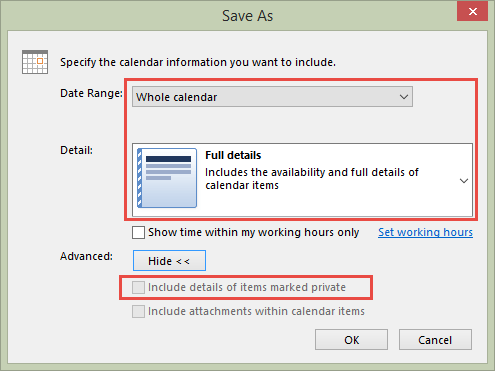 To export the calendar as an .ics (iCalendar) file, select the calendar folder in Outlook, click File, Save Calendar. The Save As dialog opens but before saving the calendar, click More Options so you can choose the period you want to export and what details to include. If you don’t change the options under More Options, the exported calendar will be Availability only, Today only. Most people will choose Whole Calendar as the Date Range and Full Details. Click Show (it is clicked in this screenshot and now says Hide) if you want to include details of private appointments. Note: Don't select Include Attachments, Outlook.com doesn't support attachments at this time. Log into your calendar at Outlook.com, then click Add Calendar and choose From file. Browse for the ics file you exported, select the calendar it should be imported into and click Save. Is this automatic sync? If not, how do you do that? The calendar that is imported into Outlook.com will be full sync. The ics is not - it would need to be published to sync and to do that, you need a WebDAV server to publish it to. my Outlook 2016 on desktop. I'd like it vice versa as well. Create an event on Outlook 2016 and automatically show up on Outlook.com. Was your account moved to the new server? If so, remove it from outlook and add it back using autoaccount setup - when it's in the profile as Microsoft Exchange, you can drag appointments into the calendar and trhey will sync up. The steps on this page are only needed with the old server or if you are using EAS account type. If you are using Outlook.com, you don't need to use WebDAV - you just need to add the account to outlook (as Exchange server, if using outlook 2007 or newer and the account was moved to the new server) and create the event in the outlook calendar. Did you change the options to export the full appointment? "If you don’t change the options under More Options, the exported calendar will be Availability only, Today only." You need to change Detail to include full details.